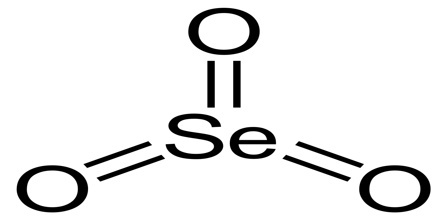 Selenium trioxide is an oxide of selenium. It is white, hygroscopic solid. It is also an oxidizing agent and a Lewis acid. It is of academic interest as a precursor to Se(VI) compounds. It is the inorganic compound with the formula SeO3. 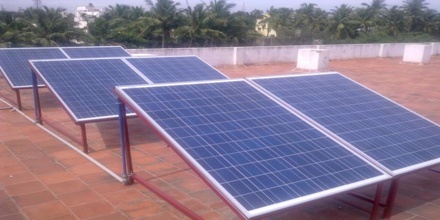 It is used in the manufacture of photoelectric cells and solar energy devices. Selenium trioxide has a density of 3.6, is readily soluble in water with evolution of heat, forming selenic acid, and soluble also in alcohol. It is insoluble in benzene, carbon tetrachloride, chloroform and ether. On heating it decomposes at 120° C. without melting or subliming, yielding the dioxide. It combines with dry hydrogen chloride to form chloroselenic acid. The molecular weight, determined by cryoscopic methods using phosphorus oxychloride as solvent, corresponded with the formula SeO3. It may also be found in silver, copper, lead, and nickel minerals. 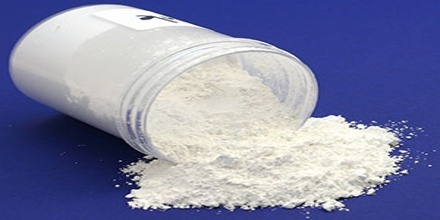 Though selenium salts are toxic in large amounts, trace amounts of the element are necessary for cellular function in most animals, forming the active center of the enzymes glutathione peroxidase, thioredoxin reductase, and three known deiodinase enzymes. In the solid phase SeO3 consists of cyclic tetramers, with an 8 membered (Se-O)4 ring. Selenium atoms are 4-coordinate, bond lengths being Se-O bridging are 175 pm and 181 pm, non-bridging 156 and 154 pm. SeO3 in the gas phase consists of tetramers and monomeric SeO3 which is trigonal planar with an Se-O bond length of 168.78 pm. The chemical reduction of materials in this group can be rapid or even explosive, but often requires initiation (heat, spark, catalyst, addition of a solvent). Explosive mixtures of inorganic oxidizing agents with reducing agents often persist unchanged for long periods if initiation is prevented. Organic compounds in general have some reducing power and can in principle react with compounds in this class. Actual reactivity varies greatly with the identity of the organic compound. Inorganic oxidizing agents can react violently with active metals, cyanides, esters, and thiocyanates. 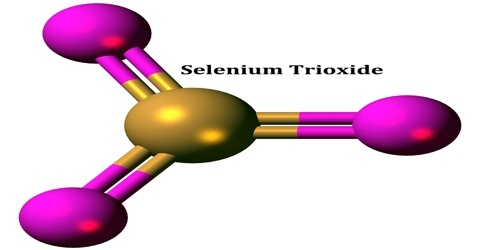 Selenium trioxide is used in the manufacture of photoelectric cells and solar energy devices. Reference: atomistry.com, chemicalbook.com, cameochemicals.noaa.gov, wikipedia.